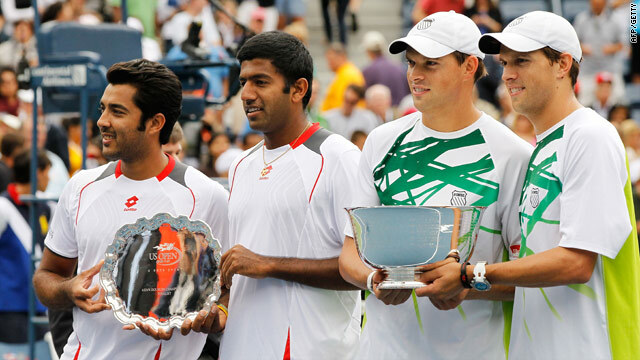 Aisam-Ul-Haq Qureshi and Rohan Bopanna (left) and Bob and Mike Bryan hold their trophies after the men's doubles final. (CNN) -- The men's pairing of Rohan Bopanna and Aisam-ul-Haq Qureshi were defeated in the U.S. Open final by the brothers Bob and Mike Bryan 7-6 (7-5) 7-6 (7-4). The unlikely pairing of an Indian and a Pakistani, nicknamed the "Indo-Pak Express" had captured imaginations around the world. "I think they are a great front-running team," Mike said of their opponents. "When they're up, they play really well; when we're up, we play really well." Bopanna and Qureshi had yet to drop a set as they entered their first-ever Grand Slam final. But the two-time U.S. Open champions put an end to that streak in a tightly contested and highly entertaining match, which was played in a packed Arthur Ashe Stadium. "The Indo-Pak Express was rolling pretty well until we met these guys," Qureshi said in the post-match trophy ceremony. Bopanna, of India, and Qureshi, of Pakistan, have been the story of the tournament. En route to the final, they took out two seeded teams, including a 6-3, 6-4 win over No. 2 seeds Daniel Nestor and Nenad Zimonjic. After the match, Qureshi thanked the Bryan brothers for their generous donation to help the flood victims in Pakistan.